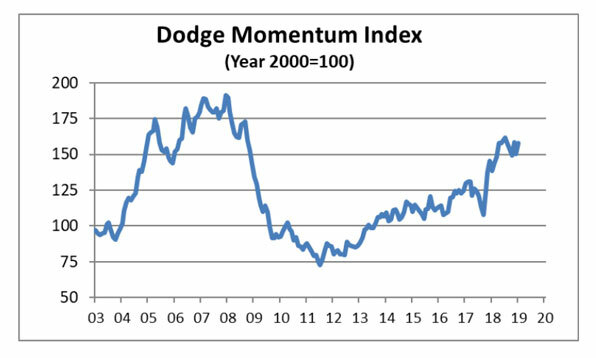 New York — The Dodge Momentum Index rose 4.7% in January to 157.7 (2000=100) from the revised December reading of 150.6. The Momentum Index, issued by Dodge Data & Analytics, is a monthly measure of the first (or initial) report for nonresidential building projects in planning, which have been shown to lead construction spending for nonresidential buildings by a full year. January’s increase reflected similar gains for the two components of the Momentum Index – institutional building, up 5.0%; and commercial building, up 4.6%. In January, nine projects each with a value of $100 million or more entered planning. The leading commercial building projects were two $300 million CloudHQ data centers in Ashburn VA. The leading institutional building projects were a $235 million arena renovation project in Phoenix AZ and a $140 million academic building at the University of North Carolina in Chapel Hill NC.